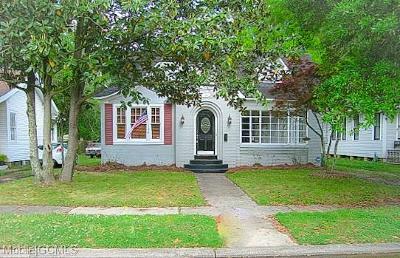 Nice home on one of midtowns most popular streets in excellent location near Mobile Infirmary. Hardwood floors are newly refinished, the interior has all fresh paint and new vinyl plank flooring in the kitchen area. This home has an excellent floor plan with a fabulous sunroom just off the Living room and bedroom. Tall ceilings, arched doorways and exposed brick in the kitchen give this home tons of charm. The backyard is privacy fenced and has a deck perfect for grilling and enjoying the outdoors. This home comes with a stainless side by side refrigerator and is move in ready. Silverwood has a once a year block party and is a great place to call home.